Last month I finally got round to organising my IPv6 setup at home, as Virgin don’t look like they are providing native IPv6 for a while and I felt I was missing out on loads some websites that support it then it was time to get things up and running. 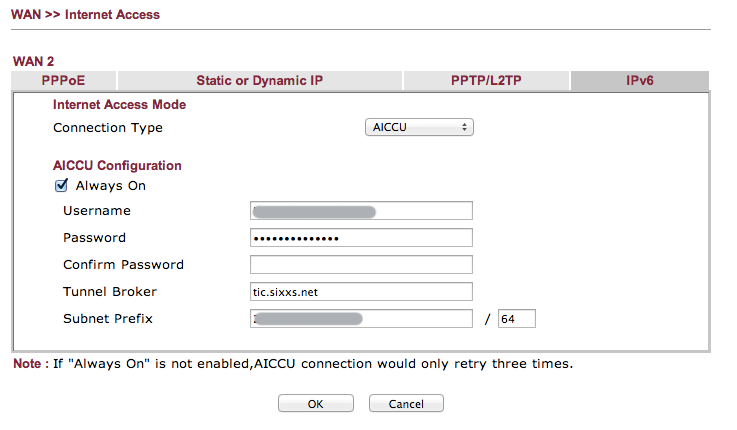 I chose SIXXS as my router supports AICCU so it was a natural choice. So, the first thing to do is create an account on the SIXXS website here. This can take a couple of days before the account is setup and then you need to request your first tunnel which again will take a couple of days. The process with SIXXS is manual which I’m sure has it’s advantages but factor this time delay in when you come to setup IPv6 on your home network. Ok, so you now have your new tunnel activated and you are ready to go. I’ve got some screen shots in here as well to try and guide through the setup. You will also need your SIXXS username and the tunnel password which you can set by clicking on the Tunnel within the SIXXS control panel and then setting the “TIC Password for this tunnel”. Ok, now get to the section within your router to setup the tunnel – I’m not going to guide you through how to access the routers web interface, I’ll assume you can already do that. 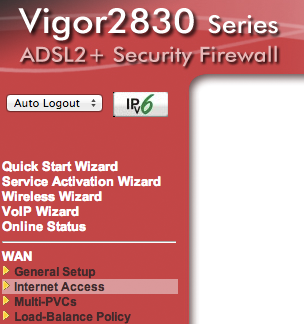 Once logged in, click WAN, Internet Access and then IPv6 as per the images below. This will take you to the page where you can enter the relevant details. Password: This is the TIC Password you setup within the Tunnel page on the SIXXS website. Tunnel Broker: For me this is tic.sixxs.net but you can get this information as I’ve said in Step 1. Subnet Prefix: Enter the Prefix from the Subnet page on the SIXXS website, make sure you don’t specify the / prefix at the end and instead enter the prefix number in the next box along.